Free tourist attractions have enjoyed a boost in visitor numbers during the recession, trade figures suggest. The Association of Leading Visitor Attractions (Alva) said its members had 10.9% more visitors overall last year. There were rises at free venues such as the National Gallery (up 9% with 4.78m visitors) and the National Maritime Museum at Greenwich (up 15% to 2.37m). Alva said the increases came as people sought good value days out during the economic downturn. Most popular was the British Museum in London with 5.57 million visitors, despite having 6.1% fewer visits in 2009. 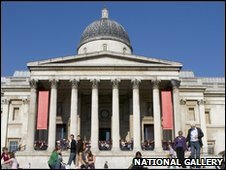 It was followed by the National Gallery and the Tate Modern (4.75 million). However, Blenheim Palace in Oxfordshire - which does charge for entry - had one of the biggest increases in visitors, with a 43.6% rise to 537,120. Avla said overseas visitors attracted by the weak pound and British tourists electing to stay within the UK contributed to the overall increase. The association is made up of the country's leading museums, galleries, heritage sites, cathedrals, gardens, zoos and leisure parks. A poll of Alva members showed 82% were optimistic about the immediate future, compared with 60% last year. Some 35% said there should be more incentives to get people to visit or stay in the UK, rather than taxing tourists. They said they would also like to see a reduction in VAT on admission tickets, and more government funding for VisitBritain to help the tourism body promote the UK abroad. Alva director Robin Broke said: "The tourism industry played a vital role in Britain's economy last year, with leading attractions working hard to maintain visitor figures and revenue in a challenging fiscal environment. "As the political parties prepare for the general election, they should consider how best to help the industry maximise the revenue it can generate and the additional jobs it can create."